When buying new tyres, it’s important to consider things like usage type, price range, maintenance and local laws before committing to a purchase. Your local car service and repairs centre will be able to help you out, but it’s a good idea to get your head around these key aspects so you can make an informed decision. What are you going to use the tyres for? There are many tyre design elements to appeal to different usage types. To determine the “grippiness” of a tyre, you’ll be looking at things like the tread blocks and material composition. Grip in wet and dry conditions is important. A hard rubber compound tyre will grip for longer, but you may have to compromise on performance. The addition of silica in newer tyre compounds means a “grippier” tyre with good wear. 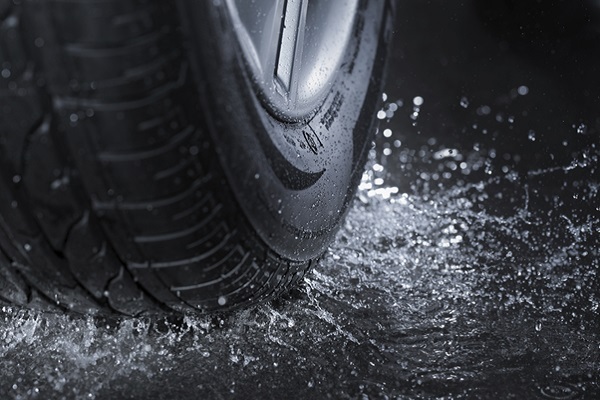 If you live in a rainy climate, or simply need better wet weather performance, you’ll need to take a look at the tread blocks design of the tyre. Those built for wet weather will have visible channels that allow water to dissipate speedily. An asymmetric tyre is built with tread blocks that are suited to both wet and dry conditions. Your ideal price range should reflect the intended use for the new tyres. Small and family sized cars have a lot of options when it comes to tyres – from less than $100 to more expensive premium tyres fitted with the latest design innovation. Conversely, premium or rare vehicles may require specialised tyres with a price tag appropriate for the brand. But if you’re the type to buy a rare new sports car, you’re usually willing to pay a bit extra for the tyres that match. What are your tyre maintenance expectations? Consider the maintenance commitment you make to your car, and apply the same care to your tyres. It’s a good idea to invest in a portable tyre gauge to monitor the pressure periodically. Your manufacturer handbook should contain recommended pressure levels so aim to stick to these. And don’t forget to book in regular servicing at your local car service and repairs centre. What are your local tyre laws? The Australian Design Rules (ADR) set the national standard for vehicle safety. There are two main rules for tyres in Australia – these cover rims or vehicle guards and labeling. Your tyres must be covered by a guard and meet distance specifications between the guard and wheel. Tyres should have a standard label including service description, construction type, maximum load rating. Additionally, the tyre should specify manufacturers name, approval code, and date of manufacture. If you are looking for new tyres we are open Monday – Friday: 8:00am – 5:00pm or you can contact us on 1300 0323 40.